I enjoy pairing juice with my sushi. Lately, I’ve not had the time to cook or prepare food. So, when I need to do takeout, I enjoy pairing a refreshing green juice with sushi from the best place for authentic Japanese cuisine, Yakko San, North Miami Beach, FL. The food is consistently delicious, most of the items on the menu pair nicely with a cold pressed green juice. I am a foodie, a lover of delicious food. When there is no time to cook Yakko San is the perfect palate experience. Their crunchy spicy tuna roll and the unbelievable mixed salad is a perfect combination to pair with my favorite green juice. 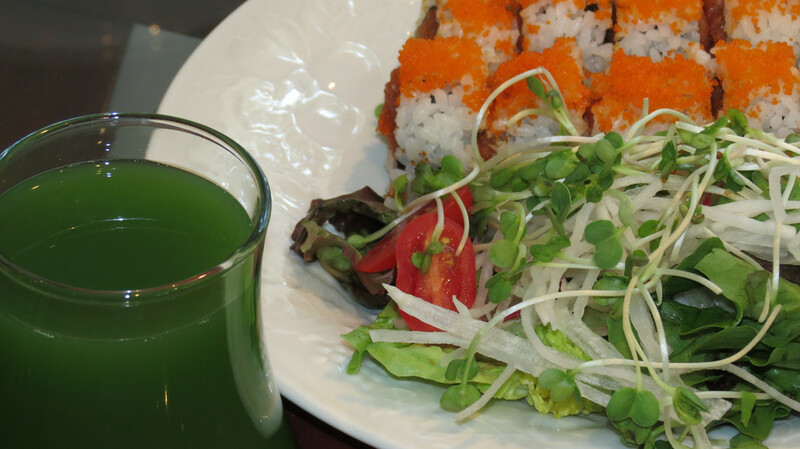 I tend to prefer a combination of various greens with cucumber and a touch of apple; the combination offers a lighter palate tasting green juice to complement the sushi and salad combo. The slight saltiness from the soy sauce and salad dressing brings out the flavors within the juice for a nice balance. The cucumber juice provides a refreshingly clean palate pleasing experience. I believe the experience is always within the palate.